Recovery from back surgery can require effort, but newer minimally-invasive surgical techniques often reduce healing time. For many common types of back surgery, patients are back on their feet in a few weeks. Back surgery that requires bone removal, fusion, or the addition of “hardware” can take longer. Recovery time for spinal surgery depends upon the type of procedure, the age, and health of the patient, and the patient’s work or activities. Endoscopic spinal surgery involves making a small incision, approximately 1 cm, inserting thin straw-like tubes called cannulas between muscle, and guiding endoscope and surgical instruments through the tubes. Because of the small incision and minimal muscle damage, the recovery time for endoscopic spinal surgery can take as little as four to six weeks, with many patients returning to work after a week. 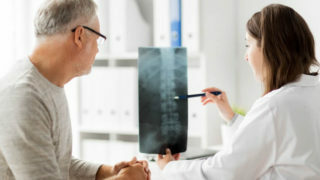 Laser spinal surgery is also a minimally-invasive technique that limits damage to the surrounding tissue, but usually requires a slightly larger incision than endoscopic surgery—typically 1.5 inches. After the incision is made a laser is used to remove soft tissue. Surgical instruments are then used to remove bone and ligament. Depending upon the surgery and number of areas affected, recovery times may be somewhat longer than endoscopic surgery. Traditional “Open” back surgery is more invasive that endoscopic or laser techniques. Depending upon the surgery, it can take several months for bones and tissue to heal and from six months to a year to fully recover. Even with today’s minimally invasive techniques, there are always risks with any type of surgery. After back surgery, it’s important to carefully follow your doctor’s instructions in order to minimize risk and ensure a speedy recovery. Take any required antibiotics or other medications as prescribed. Communicate regularly with your doctor about any unusual pain, side-effects, or signs of infection. Know your limitations and don’t overexert yourself—particular immediately after surgery. Maintain your exercise regimen in accordance with your doctor’s instructions. For more information about our services and whether back surgery is the right option for you, please contact The Spine Practice at 310-423-9792 (Southern California) or 916-734-7463 (Northern California).